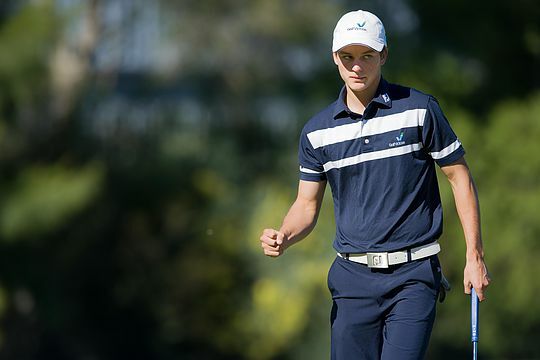 The country’s elite amateur golfers are set to commence the four-day Australian Interstate Championships, starting on Tuesday at Brisbane and Royal Queensland in a arguably the best match play team event in the country. Each State plays each other State over singles match play in a round robin format, concluding with a Final. The Men’s teams consist of eight players, while the Women’s teams consist of six players. In the Men’s competition Victoria has been the dominant force winning on the last two occasions but enters these championships having lost four players to the professional ranks. Yet the Victorians have always featured strongly and there is no reason why they will not threaten to make it three from three with the likes of Brett Coletta (pictured), David Micheluzzi and Zach Murray, all experienced match play exponents. Queensland having the home advantage will also feature this week with all team members having played the course a number of times and being familiar with the grainy greens typical of layouts in the area. Having last won in Tasmania in 2013 the Queenslanders are primed to secure victory and its a solid team on paper. The last occasion NSW won the interstate series title was four years ago at Royal Adelaide and that was only after Tasmania took them to the wire on the final day. The NSW lineup this year is particularly strong with the in-form Harrison Endycott and the experienced Travis Smyth, Austin Bautista and Cameron Davis supported well by Blake Windred, Dylan Perry, Daniel Gale and Kevin Yuan. Speculation has mounted that NSW is the team to beat at these series but as we have seen on many occasion those dubbed favourites don’t often get the trophy. Western Australia will be hunting for their break-through Men’s title win. 2016 WA Open winner Curtis Luck spearheads a talented lineup along with Min Woo Lee who recently finished second at the Sage Valley Junior Invitational in the USA. Add into the mix WA Amateur Champion Fred Lee and Ben Ferguson who finished 6th at the WA Open, Haydn Barron, Kiran Day and Cameron Jones, the Western Australian lineup packs some punch. The Western Australian team also should feature in the women’s competition with Hannah Green heading the lineup in what will likely be her final Interstate Series, featuring in three titles from her four years in the team. The women’s series see five rounds before Thursday’s final at Royal Queensland. In other opening women’s matches, Tasmania faces South Australia, while Victoria and Western Australia clash in another match to set the stage for the final. The Victorians are the current title holders with the last six series falling either into Victorian or Western Australian hands. New South Wales last won the series in 2009. Keep an eye out also for South Australia as they attempt to secure a double win in the Men’s series, having won with NSW the Boy’s Interstate Series title last month in Tasmania.